My overriding passion is form.Working in all media to create art that has fluidity and purity of line. I am fascinated by primitive visceral interpretations of the natural world and man’s relationship with nature in the modern day. My influences from ancient civilization have led me to abstract and invent new ideas that include the viewer on subjects of vulnerability, freedom and relationships. Through new discoveries of artistic methods, I have begun working in materials such as copper and glass – areas that I wish to expand on and exhibit to the wider public. 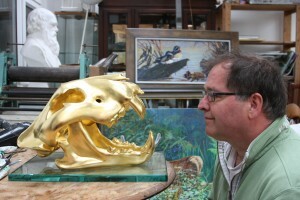 Martin Hayward-Harris and Gilded Tiger 2063. This sculpture can now be seen at the International Nature and Art Museum, Twigworth, Gloucestershire. Artists For Conservation Vancouver .B.C. The David Shepherd Wildlife Foundation. His animal bronzes were chosen by The Daily Mail as the centrepiece of the Hampton Court Flower Show, his bronze hare had been sold by Christies, in 20th Century British Art ,along side Picasso and Lowry. Much of Martins bronze output during The Nineties supported the World Wildlife Fund and there fore has been catalogued. Martins Begging otter was in an article in Country Life promoting the Sporting Art Sales, it sold for six figures. More recently Bonhams sold his Bronze otter at The Sporting Art Sale in 2014.Martins folio includes larger scale pieces. Among these is a sculpture of a tank crew displayed in Whitehall, London and a monumental abstract bronze for the Far east.Martin Hayward-Harris was born in Reading in 1959.From childhood he has been facsinated by animals and birds. At sixteen he had a placement at Reading Museum , which inspired his whole future.There was a museum display of Victorian Taxidermy and an Art Gallery with great Wildlife artists represented in its collection ,notably A W Seaby and Robert Gillmor.It was at this point Martin spent every waking hour drawing in sketchbooks. He attended lectures at the Reading Ornithological Society at Reading University and went on to visit the Childe Beale park Basildon to draw live birds. Martin was given the opportunity to rear three orphaned tawny owl chicks for release while still at school. Giving him more opportunity to study at close qaurters .This fascination meant he needed to understand anatomy and learn the Art of Taxidermy. The process of assimilating this knowledge where a road kill bird would be drawn measured photographed and then preserved.He joined The Guild of Taxidermists 1976. encouraged by Simon Trodd of the Southern Museums service. To continue in his education Martin was originally accepted on the only Wildlife iIlustration course in the country, at Dyfed College of Art.His skills are very broad based ,and fortune would have it that his course at The Berkshire College of Art and Design allowed him to become proficient at widely varying media which ultimately gave him a career.With a degree course in full swing Martin was offered a sculptors post at a company that worked for film and television, He even got a union ticket which would allow him to be full time on film at Pinewood Studios Buckinghamshire.He chose to complete his four year course and graduated in 1982.Martin returned after his course to Kier Lusbys at Shepperton. He had landed on his feet. he revels in making things and the company wanted him to make a carving of the Statue of Liberty head. for the Comedian Jasper Carrot.The owl chicks had grown up and left the nest so Martin moved to Binfield Heath Oxfordshire. it was a chance opportunity where an advert for sculptor and Taxidermist at the Natural History Museum London in The Guardian.This was the job that Martin had always wanted to create dioramas and do taxidermy from a scientific educational point of view. he was offered the job and moved to Cricklewood North London. The Museum was going to refit The Whale Hall and Martin was asked to make a sculpture of the Great Blue Whale and calf which still there today. After four years at The Natural History Museum Martin was headhunted for a Konservators post at The National Museum of Denmark.He took the opportunity to travel to Sweden and visit Lars Johnson the Bird painter and follow the trail of Bruno Lilejors another artist that has influenced Hayward-Harris. The whole idea of relocating and learning a new lanquage was quite daunting let alone the thought of Mounting a Orangutan became a step to far. Martin resigned and wanted to be a full time artist and sculptor.Robert Gillmor came to the rescue and well put letter about a plan for his future .Martin had steeped himself in drawing whilst in Denmark and now could return to the UK studying under John Busby, Peter Partington ,and Robert Gillmor and entering work in the The Society of Wildlife Artists Exhibition in 1988.Martin had travelled to Kenya the previous year recording his travels in a bound sketch book and survived a landslide on the eqautor for three days without food and water. his work from there supported the W.W.F selling a Fish eagle painting at the’ Whaletail ‘Auction at Sothebys in Niarobi. In the UK Martin studied under Peter Partington a fine etcher,printmaker and teacher from which many new etchings appeared that where sold in America with the publishers H.C.Dickens. Martin bought a house in Old Erlegh near Reading and created his first bronze a Bull Elephant inspired by the work of Rob Glen in Niarobi.Martin wanted to utilize his skills and learn about bronze casting and got a post as a bronze finisher in Basingstoke UK. Martin was hired by a company in London to sculpt life size Iron Age pig and Exmoor pony for a museum in Wales. By the earley nineties Martin was producing his smooth semi abstract bronzes which went to auction at Christies in support of the World Wildlife fund Martin continued to exhibit at the SWLA every summer. After leavingThe Berkshire College of Art Martin trained at the Natural History Museum, producing a sculpture of a blue whale and calf which remains on display to this day. 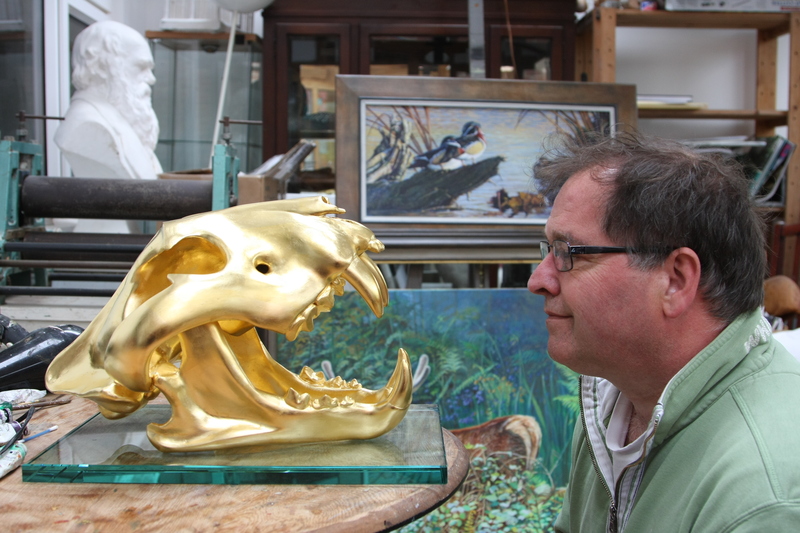 Moving to the National Museum of Denmark he worked with some of Europe’s greatest wildlife artists, visiting China in 2007 to study that country’s influence on bronze casting. Martin has also been resident artist at the International Nature in Art Museum.Gloucestershire. Martin’s European Roller entitled Jewel in the Crown and Horus Falcon were shortlisted for the Royal Academy in 2011; his Horus falcon Bronze for the DSWF Wildlife artist of the year 2012 and his Barn Owl bronze featured at the Artists for Conservation festival Vancouver 2012. and went onto Exhibition in the Sonora Desert Museum Arizona. His Bronze Horse a purebred Arab Stallion featured in The Arab Horse Society Year book 2013 with his thesis on its construction which took three months. In the same year Martins Gilded tiger 2063, a gold Siberian Tiger skull which underpinned The Tiger time project by The DSWF went on to be reported on in The Wall street Journal New York and is now on show at The International Nature in Art Museum Gloucestershire. 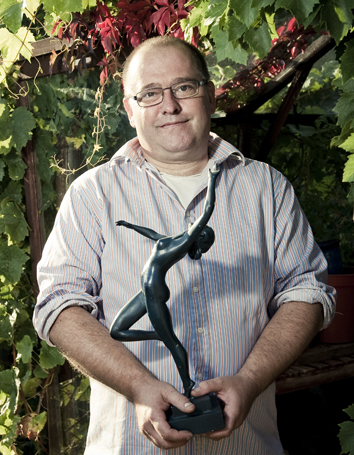 In 2014 Martins work was at Henley Festival including The Little Dancer which will soon be available.